Dear friend, fans of scooters and travelling. 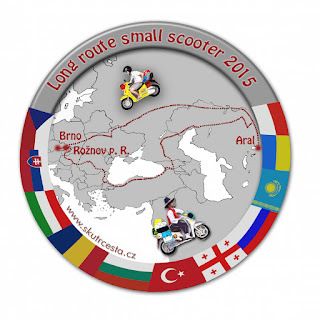 We would like to introduce you your long round on small scooters, which starts on the 1st on August. We decided to go to Kazakhstan on two scooters Honda SH 150, which we bought for $800 each. The idea is to show to us and also others, that a huge budget is not necessary for a long distance travelling and also, that even a small scooter can compete with a huge travelling bike, if you have enough enthusiasm. We drank beers after driving Bobcross in winter and spoke about travelling on scooter. I said to Radek my dream - to go to Kazakhstan and see the dryink Aral lake, but I am missing a buddy. Radek commented this with words, that he is for every crazy idea that covers scooters, but he thinks that the scooters will not do it. I am saying that they will, so I made a bet for a small beer, that we will arrive back on the wheels. In following weeks we will bring you news about preparations and the journey. Our first stop is scooter camp in Slovakia, from where we drive on 1st to Romania and Bulgaria.